Vasu Nair, Georgia Research Alliance Eminent Scholar and director of the UGA Center for Drug Discovery, has developed a drug that blocks HIV from inserting its genome into the DNA of the host cell. 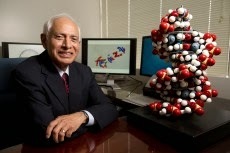 "In our laboratories, we have discovered a highly potent HIV integrase inhibitor, or blocker, aimed at the 'point of no return' in HIV infectivity," said Nair, who is the Georgia Research Alliance Eminent Scholar in Drug Discovery in the UGA College of Pharmacy. "This inhibitor is highly effective against many variations of HIV." Cell signaling, the transmission of information by molecules that coordinate and direct cellular actions, plays a key role in HIV cell invasion and the hijacking of cellular biochemistry, allowing the virus to replicate itself. In the initial stage of HIV infection, the body's immune system releases antibodies to attack the virus. Helper T-cells, called CD4+ cells, play a central role in the body's immune response, orchestrating other cells in the immune system to carry out their specific protective functions. In its invasion of CD4+ cells, HIV recognizes and attaches itself to the outer surface of the cell, penetrates it, sheds its outer coat, releases its 15 viral proteins and a ribonucleic acid and proceeds with exploiting the human cellular biochemical machinery to reproduce itself in massive numbers. "Of all of the steps involved in the replication or reproduction of HIV in its infectivity of the human system, the single most devastating point is the incorporation or integration of viral DNA into human chromosomal DNA," said Nair. This insertion of viral DNA into human DNA occurs through a complex biochemical process that is facilitated by HIV integrase, a viral enzyme. Only after this crucial step is the viral invader in a position to exploit human cellular biochemistry to reproduce itself in astonishing numbers to ultimately bring about the destruction of CD4 lymphocytes, the coordinators of the immune response system of the human body. As the infected T-cells die, the immune system of the infected body is unable to defend itself; opportunistic infections such as pneumonia, meningitis, antibiotic-resistant TB and other bacterial and viral infections become deadly. HIV and, eventually, AIDS and drug-resistant tuberculosis are a particularly deadly liaison, which kill a quarter of a million people a year, according to the WHO. "A devastating consequence of the integration step is that once viral integration has occurred, it cannot be reversed," Nair said. "That's why integration is viewed as the 'point of no return' in HIV infection." The drug developed in Nair's lab blocks the viral enzyme from inserting its genome into the DNA of the host cell. While Nair acknowledges an HIV vaccine that eliminates the virus altogether may not be doable, therapies that allow people to live longer lives while infected are attainable. "I don't really think that a single vaccine would be truly effective in providing total immunity against HIV because the virus has multiple forms or subtypes," he said. "By inhibiting replication while viral counts are still low, however, a drug can render HIV almost entirely impotent." Research efforts worldwide on HIV integrase inhibitors have resulted in two Federal Drug Administration-approved drugs. However, co-infection of HIV with Mycobacterium tuberculosis and other microbial and viral agents has introduced added complications to the HIV pandemic, requiring drugs that work well together for antiviral combination therapeutics targeting HIV. Targeting the virus, rather than the human mechanism that allows it to reproduce, prevents interference with enzymes that are key to the natural and required biochemical metabolic processes in the human system. "The compound displays low toxicity, which is very important," Nair said. "Its resistance and related drug susceptibility profiles against resistant HIV-1 isolates are favorable. When taken together, the antiviral activity profile and the drug interaction profile of our integrase inhibitor present a compelling case for its further development as an anti-HIV/AIDS therapeutic agent." The therapy is now in the pre-clinical testing phase. "There are potential ramifications of this invention in other therapeutic areas, as well as in co-infection therapeutics," said Nair. "This is perhaps the most exciting aspect of our discovery." The research was funded through the Division of AIDS in the National Institutes of Health's National Institute of Allergy and Infectious Diseases. Results were recently published in the journal Antiviral Research.